ASM News called the 4th Edition of Dr. Murray's best-selling book "the most colorful and fun text to read in medical microbiology." Now it's back in an updated New Edition—and it's as succinct, user-friendly, and authoritative as ever. Readers will continue to enjoy its lucid discussions of how microbes cause disease in humans. Expert coverage of basic principles, the immune response, laboratory diagnosis, bacteriology, virology, mycology, and parasitology ensures they understand all the facts vital to the practice of medicine today. More than 550 brilliant full-color images make complex information easy to understand and illustrate the appearance of disease. Offers readers a practical understanding of microbiology by focusing on why the biologic properties of organisms are important to disease. 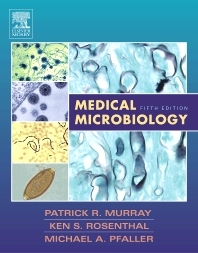 Examines etiology, epidemiology, host defenses, identification, diagnosis, prevention, and control for each microbe in consistently organized chapters. Emphasizes essential concepts and learning issues with summary tables and text boxes. Correlates basic science with clinical practice through review questions at the end of each chapter. Defines and explains new terms.